Harner et al. Factors Contributing to Poor Physical Health in Incarcerated Women. Journal of Health Care for the Poor and Underserved, 2013. Rich et al. Women, Incarceration, and Health. Women's Health Issues, 2013. Dignam et al. Health Rights in the Balance: The Case Against Perinatal Shackling of Women Behind Bars. Health and Human Rights, 2014. Schonberg et al. What Women Want: A Qualitative Study of Contraception in Jail. American Journal of Public Health, 2015. Daugherty. Journalist takes a hard look at the U.S. prison experience for women, America’s hidden human rights crisis. NY Times, 2017. Kelly et al. Challenges to Pap Smear Follow-up among Women in the Criminal Justice System. Journal of Community Health, 2017. Dr. Lyon is the Chief Integrated Health Officer at Heartland Health Outreach serving the primary care, behavioral health, psychiatric, and oral health needs of people experiencing homelessness in Chicago. 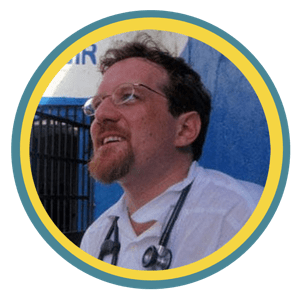 His academic interests encompass global health, human rights scholarship and advocacy, social medicine, prisoner health, and medical education. He has collaborated with Partners In Health in Haiti and at other sites for more than 20 years. Dr. Lyon is an advocate, researcher, and author on health and human rights. 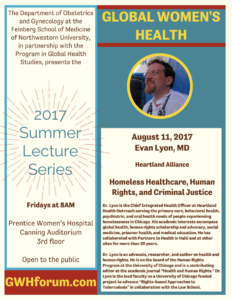 He is on the board of the Human Rights Program at the University of Chicago and is a contributing editor at the academic journal “Health and Human Rights.” Dr. Lyon is the lead faculty on a University of Chicago funded project to advance “Rights-based Approaches to Tuberculosis” in collaboration with the Law School.